This little unit is a working model of a Butler 100A torch made in Preston (now Cambridge), Canada. Although Butler made units with brass tanks, my prototype actually had a steel tank painted with a metallic bronze-coloured paint. I elected to make a brass tank as this is a recognizable trait of typical vaporizing blowtorches of this type. The tank is not made from sheet, but turned and hollowed out from solid brass on the lathe. I have a good supply of propane and butane torches in a wide range of sizes on hand in my workshop. Building this little model was purely for recreation. I should point out that exactly scaling a vaporizing burner to such a small size has certain limits, unless the liquid fuel is "scaled" as well. Due to the very small burner head this would necessitate the use of a fuel which would require less heat to vaporize than gasoline. In operation this model functions quite well for short runs. Once the tank is filled a few strokes are applied to the air pump. Holding a finger over the end of the burner while opening the fuel valve cleanly and easily fills the black priming cup underneath the head. Then valve is closed and the liquid fuel in the priming cup is lit with a match. Just as in a full size version, a yellow smoky flame engulfs the burner head, heating it up to vaporizing temperature by the time the fuel in the cup is spent. Shortly before this happens the valve is re-opened and a nice roaring blue flame issues from the burner. The sound can be heard over a considerable distance. However This scale model torch cannot maintain the blue flame indefinitely. It eventually fails to vaporize fuel fast enough to replenish the initial priming heat in the mass of the burner head. Of course it would be simple to design a head this size that would easily run on gasoline (petrol) or naphtha, by including a small vaporizing coil in or around the large end of the burner head - but then it wouldn't be a scale model. As it is, it was necessary to add three holes on either side of the burner for secondary air which were not on present the prototype. The burner head was made from copper for good heat conduction. The individual pieces of the head are silver brazed. The priming cup was milled from steel and like the valve handle is not painted. Both were heat-blackened and quenched in oil to resemble the full size prototype. Two cleanout screws can be seen on the ends of the burner passages. The steel hex piece near the center of the burner unit is the nozzle. The large brass nut at the back tightens the packing around the rotating needle valve stem to prevent leakage. The head is threaded onto a steel tube which protrudes deep into the tank. It carries a large wick which conducts fuel up from the tank to the vaporizing areas of the head. Like the shell, the bottom was turned from solid brass rod and then silver brazed to the tank. Note that the shape of the bottom prevents overfilling and leaves the required amount of air space in the tank. The brass pump is a perfect miniature of the original. It has a foot valve to keep the pressurized gasoline inside the tank. The pump leather was formed from a tiny disk of thin leather cut from a belt (belonging to my wife). The handle was turned from a piece of the trunk of a small Flowering Crab tree that we removed from our garden. 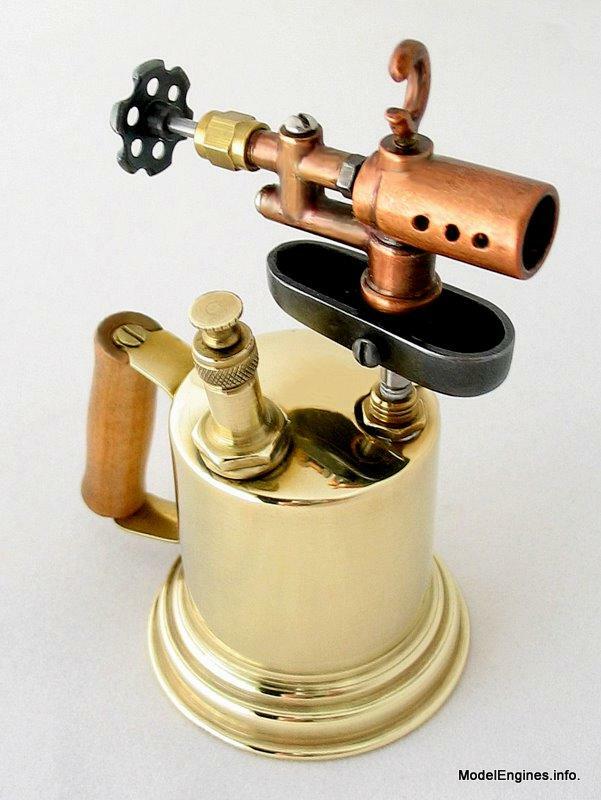 The hook was a common feature on a plumber's blowtorch - it held a soldering iron or copper in position in the flame. Cordless soldering irons came long before the corded type! © John R. Bentley 2012.